The HD800 series drifters are designed to minimize drill noise and vibration without sacrificing performance. Incorporating a new piston design, the HD800 series drifters maximizes energy transmission and drills effectively in a variety of rock types. A new piston actuating mechanism performs with more percussion and generates more power at the same time, outperforming the FRD’s HD712 drifter. The drifter’s wedge type piston allows for greater impact efficiency. The Furukawa HD800 Series drifter (patent applied for) is designed to minimize drill noise and vibration, while increasing performance. 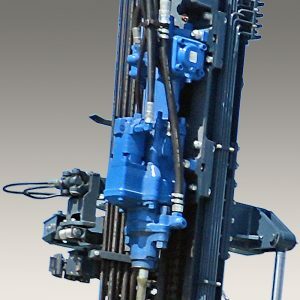 With more impact, this drill has the ability to perform in harder rock at a larger diameter. Stabilizes the bit against the rock, ensuring efficient energy transfer and straighter holes. Automatically adjusts the drifter for maximum performance regardless of the rock condition.